A HEALTHIER HOME BEGINS WITH NO VOCS - Decor Designs, Inc.
Got an upcoming home decorating project that requires painting? Well things have changed a lot in the paint business in the last few years and not all paints are created equal. If you are concerned about your health and the environment, check out a few of these ideas before selecting your paint. NATURAL PAINTS These paints are made from natural raw ingredients such as water, plant oils and resins, plant dyes and essential oils, natural minerals such as clay, chalk and milk casein. If they are water based, they generally give off almost no smell. Those that are oil based take on the fragrance of the essential oil used. These paints are largely the safest for your health and the environment. ZERO VOCs Any paint in the range of 5 grams/Liter or less VOCs can be called Zero VOCS. Be aware that some manufacturers may claim Zero VOC but these paints may still contain tints, biocides and fungicides that contain some VOCs. Adding colorant (tint) alone can sometimes add up to 10 grams/Liter (still quite low). LOW VOCs Water based paints are obviously a better choice than their petroleum based counterparts when it comes to VOCs. Low VOC paints contain no or very low levels of heavy metals and formaldehyde. While they may still emit an odor when applied, that usually disappears quickly once dry. The amount of VOCs can vary greatly between brands and manufacturers and should be listed on the can. Low VOC paints are generally those with 50 grams/Liter or less. 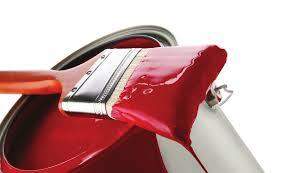 New and improved paint that is more healthy and environmentally friendly is making a big splash in the market. Make sure you ask for it at your local paint retailer. This entry was posted in Color, Decor Designs, Inc., Decorating Tips and tagged Decorating Tips on June 8, 2014 by Jeff Rice.